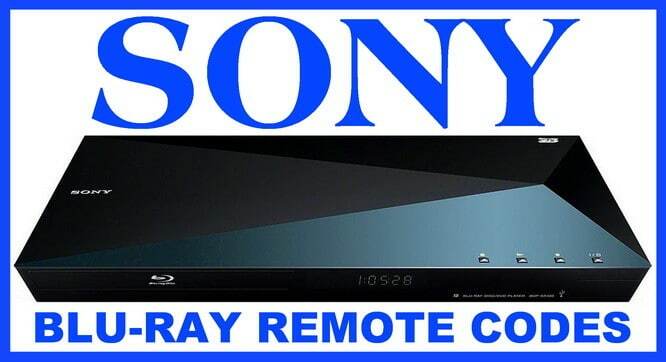 Looking for remote codes for your Sony Blu-ray Player? Here is the list with the KNOWN working device codes for Sony Blu-Ray DVD players. These should work with ANY remote as these remote codes are universal. If these codes DO NOT WORK on your Sony Blu Ray player, please leave a comment below and we will assist you and update our list. I can’t find the code for my sony bdv-ef200 (remote control model: rm-adp058) please help! I have a UR5U-8780L-TWC universal remote and cannot find a valid code for my Sony BDP-S5200 blu Ray player. Please help. Sony blu ray – BDP-S350 with Cox remote URC-8820-MOTO. Please Help! I have a Sony BDP-S3700 Blu-ray. Trying to program a Charter Spectrum remote to control it. Tried all five digit codes on Charter website and tried to search for code with no luck. Called Charter and they said their remote doesn’t work on Blu-ray players. Hard to believe. Looking for blu-ray code for Sony bdve190. how do i program my sony bravia remote to my sony bluray player sony BDP-BX58? I have a Sony bdp s1700 blue ray/ DVD player and the 5 digit codes don’t work for my rca remote. 5 digit codes not work. I have a Sony BSP-S390. Trying to code universal remote with Sony Blu-ray model BDP-S6700. I have an RCA remote model RCR314WR. I also have directv remote RC66. I also have directv remote RC65. Should I use the sat-cbl-strm or the vcr-dvd button? I broke my remote control for my Vizio Smart TV. I was wondering is it possible to program my Sony BD rmt B104a remote control for my DVD Blu-ray player to work on my Vizio TV? Trying to connect RCA universal remote to Sony Blu ray BDP- S2200. Went through all of the codes mentioned. Help! I followed your codes but I couldn’t find any that would help? Can you please help me? Thanks! I’m trying to connect an RCA universal remote #RCR002RWDZ to an Sony bdp bx370 blu-ray player. I have a bdp-s6500, none of these codes work on comcast remote, any other codes? Will not work when I scroll through remote random coding either. I have an RCA RCR314WZ remote. I need a 5 digit code for a Sony BDP S300 Blue Ray Player please. I have a SONY BLUE RAY BDP-S360 can’t five the 5 digit code to connect to amazon prime. Sony blu Ray DVDs model BDP-S580. Need code for RadioShack 4 in one remote. thanks. I can’t get my universal remote to connect to my Blu Ray player I have a jumbo universal remote by innovage any suggestions? I have a Sony Blue-ray UHP-H1 and cannot find a code that works. Need codes for Blu-ray bdp s3200. I am using RCA remote. Looking for remote code for Sony wireless DVD player BDP-BX510 with Harman/Kardon amp. Thanks! I have a sony bdp-bx370. Trying to control it with the remote from my panasonic tv Th46-pz800u the remote is model number N2QAYB000220. It uses 4 digit codes. I have a sony blue-ray disc/dvd player BCP-S360 and am trying to pair it up with a Samsung universal remote BP59-00125A. I have a GE 6 device universal remote control that I’m trying to use for my Sony Blu-Ray player that is 4k UHD, 3D, wi-do ready and none of these codes work! The auto program don’t work because when the blu-Ray light cuts off it’s impossible to lock that code before the remote goes to another code! Plez help!!!! Trying to connect my Sony Blu-Ray DVD player BPD-S3100 to my universal remote control #2025B1-X1. It requires a 4 digit code and I have tried all the Sony Blu-Ray codes. I am trying to program my Mitsubishi remote control to my BDP S360 blu ray player. Tried many many Sony codes for GE universal remote. Even tried the “auto search” on remote. Any ideas? Besides hunt down Sony unit on ebay, or try different universal rig? I have a Sony bdp 6500 that i would like to pair up with my Onkyo receiver. The receiver remote needs a 5 digit code. I’ve been trying for 2 days now to program my Sony BDP-BX110 blu ray/dvd disc player to my Charter remote 1060BC3-0780-001-R.
Having trouble programming my Sony Blu-Ray BDP-S360 with my Bose Cinemate universal remote. Thank you the code on front screen 31516 finally! 2 hour ordeal! I have a blu ray player s4100 and I’m using a universal remote to try to get it to work. It plays dvd as well so when I’m searching I press dvd. I tried the codes for sony blu ray but none seems to work. Need to replace a SONY remote BD RMT-VB201U. Will other work? BTW, mine will OPEN/CLOSE and that’s all. Have bought new batteries. There are many different Universal Remote Controls that will work with a SONY Blu Ray Player. Check at any electronics store or buy the same exact remote on Amazon or from SONY directly. I have a Sony Bluray player BDP-S3100. I am trying to connect a RCA universal remote to. I have tried 41516, 42178, 42180, and 11516. None work. Where do i go from here? Please the code for Sony Blu ray BDP S185 for a remote. Pressed the first # and it blinked fast and it shut off the light on the remote. Can you tell us the model number of the Sony Blu-Ray Player and the model number of the remote you are using? We can then explain how to program the remote to work with the Sony Blu-Ray Player. I am having trouble finding the right code to program my BDP-S360 player to my Mitsubishi remote. Could you send me the correct code please? The remote control code for your SONY BDP-S360 is 7562 and can be used with a Mitsubishi remote. I have a Sony Blu-Ray bop-s5500 and an Insignia TV. My remote with Sony player has no numbers just color buttons and arrows. None of their combos seem to work. Please help. Check our Sony Blu-Ray Players Remote Codes page. My remote has no number keys so I can’t enter a numeric code. What remote model number do you have? Need code for Sony DVD/BLU RAY player BDP-S570. Check the SONY BDP-S570 Manual PDF for full info. There are some codes at the bottom of the PDF file. I have a Sony bdv-e2100 Sony blu ray player and a GE universal remote. I have a Sony bdp-s5200 blue ray player trying to use dish network universal remote made by Echostar technologies 186228. Have a Sony blueray BDP-s1100 can’t find correct code? I have a sony blu-ray player and two types of xfinity remotes. None of the codes seem to work. Any suggestions? I have Charter communiations universal remote and I have a Sony 4k UHD Blu Ray / DVD player. I lost the factory remote and want to program this universal remote but the codes you list don’t do it. The remote specifies that I use a 5 digit code (for all the things it supports in it’s manual) but it doesn’t seem to like numbers that begin with 42xxx at all.